José Encarnacion Peña (1902-1979, also known as Soqween) was a painter and potter from San Ildefonso Pueblo and the nephew of potter Maria Martinez. He studied painting under Dorothy Dunn at "The Studio" of the Santa Fe Indian School in the early 1930s. 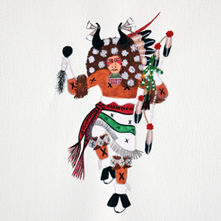 Peña was known for his watercolor and mural paintings of dances, as well as pottery figurines and fetishes. His wife Patricia Pena was an award-winning dollmaker.